As Commander-in-Chief, Washington wore two epaulets, one on each shoulder, as seen in numerous portraits made during the war. As an indication of rank, epaulets such as this one embodied the concerns of Washington and other leaders for legitimacy, authority, and respect in a period of tremendous upheaval. Though epaulets were worn by enlisted men with rank, particularly corporals and sergeants, epaulets made of fine metals such as silver or gold primarily indicated officers’ ranks. Officers, unlike enlisted men, provided their own uniforms, arms, and equipment, including the appointments required by their rank. This was the norm in European armies, and the Continental Army derived its practices from many of the same traditions. Unfortunately for Washington, early in the war the army greatly lacked uniforms and associated badges of rank. As he wrote in 1775, shortly after the Battle of Bunker Hill, “As the Continental Army have unfortunately no uniforms, and consequently many inconveniences must arise from not being able always to distinguish the commissioned officers from the non-commissioned, and the non-commissioned from the privates, it is desired that some badges of distinction be immediately provided.” He suggested red or pink cockades for the hats of field officers, yellow or buff for captains, and green for subalterns (junior officers). Epaulets on the right shoulder would distinguish sergeants (denoted by being made of red woolen cloth) and corporals (green). Uniforms and proper rank insignia were important not only to distinguish ranks but also to make the Continental Army legitimate. The Continental Army was a force engaged in rebellion and treason and considered by many, including potential European allies, to be inherently illegitimate. To combat that sense, uniforms helped establish the authority of the Continental Army (and its officers) and its purpose and legitimacy as the military arm of a civil power, the U.S. Congress. 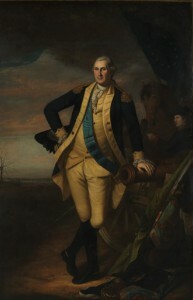 From the very beginning of the war Washington, as Commander-in-Chief, wore a uniform of blue trimmed with buff. His uniform gave legitimacy to his command, and he acted as a legitimate army commander. For example, he refused correspondence from British Commander-in-Chief William Howe (1729-1814) when letters failed to address him by rank. Because Washington’s uniform had gold buttons, he accordingly wore epaulets of gold. Other officers, too, usually acquired uniforms. By mid-war it was typical to find the officers of Continental regiments serving in uniforms that corresponded with the uniforms of their men, but with one or two epaulets on their shoulders, with the highest-ranking officers wearing two. In this the Continental Army was not dissimilar from the British Army, whose officers also wore epaulets, the number typically determined by rank. Epaulets marked not only military rank but also social rank. Although officers in the Continental Army did not purchase their commissions, as was the norm in the British Army, and sometimes even were elected to their positions, they still tended to be (and were expected to be by their superiors and inferiors) of higher social status than their men. As in the British Army, Continental Army officers were supposed to provide their own uniforms and equipment, most states expected them to have the financial wherewithal to afford it. As a reflection of their social rank, officers typically wore finer things than enlisted men. Washington, as a gentleman, naturally wore the best he could obtain. His uniform was expertly and personally tailored for him, made of the best English woolens he could obtain, and trimmed with gilt buttons. The epaulets on his shoulders, no less than the coat they were attached to, reflected Washington’s social and military rank in that they were made with gold and privately purchased. This social distinction, however, became increasingly problematic over the course of the Revolution. Americans inherited from their British past a distinct fear of armies as being potentially dangerous tools by which tyrants could come to and wield power, the historical examples of Caesar Augustus (63 BCE-14 CE) in Rome and Oliver Cromwell (1599-1658) in England foremost in their minds. Though many of those concerns quieted when Washington resigned his commission at the close of the war, and when the Continental Army was disbanded in 1783, those fears contributed to the United States choosing not to adopt a significantly sized standing army until well into the nineteenth century. How could the importance of social rank in determining military rank be squared with a republican society? How could republican society be established without an army that could function cohesively and win the support of foreign allies, such as France? Such questions set the tone for the political debates during and after the Revolution in Philadelphia, which in 1790 became the capital of the newly created United States. Text by David Niescior, M.A. in American History from Rutgers-Camden, historical interpreter at the Old Barracks Museum in Trenton, New Jersey, and winner of the 2016 American History Award for graduate study from the National Society of the Colonial Dames of America.